GOT SHADE? | Faddegon's Nursery, Inc.
As with the annuals for sun, there are workhorse annuals I rely on for shady locations. Whether in the garden, window boxes, hanging baskets or patio containers, these plants must earn their keep and provide easy color throughout the season. I use Osmocote, a time-released fertilizer, when planting or digging them in. This feeds them for three to four months so I don’t have to worry about mixing fertilizer or applying it every few weeks. Begonias – This group of plants covers a wide variety of types and they are not your grandmother’s wax begonia. Although wax begonias are useful bedding plants – 6 to 9 inches tall – they can take sunny as well as shady locations and have bronze as well as green leaves. 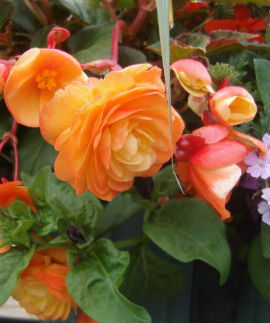 Reiger or elatior begonias come in colors from white and yellow to corals, pinks and reds. They will give you masses of color from May to September. 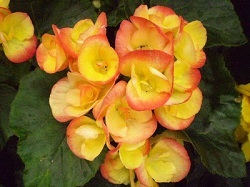 Tuberous begonias also come in a wide range of colors and their flowers are larger and very showy. Do not let the soil for tuberous begonias become soggy – they hate that. 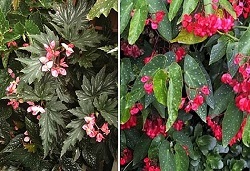 Begonia boliviensis – the best known variety is ‘Bonfire’ – are perfect for hanging pots. Their bright orange flowers can be seen from across the street. New varieties with redder or pinker flowers are also available. Then there are the begonias grown mainly for their leaf color. I use Rex begonias in pots with other shade annuals for a show of color all summer in morning sun or bright shade locations. You can’t beat the range of leaf variations. Blotches, splashes and sprinkles of bronze, red, pink, purple, silver and green on leaves that are crinkled or curled, metallic or matte. We can’t forget the Angelwing or Dragonwing begonias – a cane type of begonia these plants are taller at 14 to 18 inches. They have pendulous flowers of pink or red which will set off the green or bronze spotted leaves to perfection all summer long. Whew – grandma would be delighted! 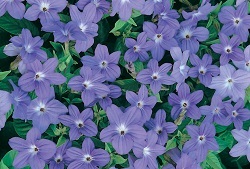 Browallia – These plants flower in shades of blue and white. They are heat lovers and aren’t always available until temps warm up. They will flower all summer with morning sun and afternoon shade. Beautiful blue star flowers cover plants 14 to 18 inches tall. 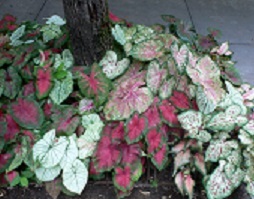 Caladium – Many shade plants rely on color in their leaves, and caladiums are bred to fit that bill with heart-shaped leaves of red, pink, white, chartreuse, rose and green in speckled, edged, veined and solid combinations. Plants are 12 to 24 inches tall and although they do flower, the flowers aren’t anything to write home about. But the leaves will give you color all summer. Plant them with variegated ivy, polka dot plant (hypoestes), or ferns to provide contrasting texture and complementary colors. 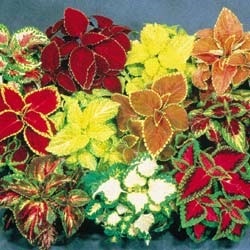 Coleus – New color combinations are introduced every year. Your grandmother would know this plant, too, but she would be amazed by the variety of reds, pinks, bronzes, coppers, lime green and purples available. Be sure to read the tags carefully – some plants will have smaller leaves and a trailing habit, while others will get big leaves and soar to 30 inches. Many coleus will do well in sunny as well as shady spots. These no-fail plants are indispensable when you need a splash of color to complement flowers in a pot. Fuchsia – Not just the little petticoat flowers in hanging pots, there are many upright varieties that do very well in containers. ‘GartenmeisterBonstedt’ is a tall plant – 1 to 3 feet – with bronze leaves and tubular orange-red flowers that hummingbirds love. Upright fuchias are available in ranges from 10 inches to 24 inches tall with soft pink to red and purple flowers. I use them in containers with other shade plants for a touch of elegance. 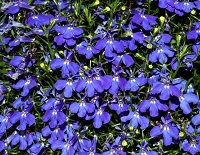 Lobelia – I just love the blues and lavenders of these delicate little flowers – they come in white and bi-color also. Although frequently listed with the sunny annuals, for me they perform best in morning sun and afternoon shade. I tuck them in containers for that wonderful blue and airy texture to offset other broader leaved plants. New Guinea Impatiens – This variety of impatiens is not affected by the Downy Mildew which has afflicted Impatiens walleriana. The New Guinea impatiens can also grow in sun or shade. Plants are 8 to 12 inches tall and flower colors come in white, pink, coral, orange and red and many shades in between, some flowers also have white or picotee edges. Leaf colors are bronze or green and some have variegated leaves. 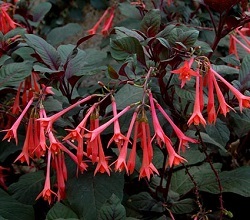 The dark leaved varieties set off the flowers beautifully. 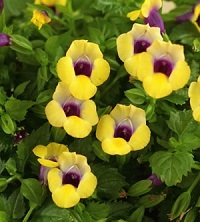 Torenia – This plant, also called wishbone flower, will crank out flowers all summer into fall. Flower colors are blue, pink, rose, white and yellow with a purple center. Torenia is also a magnet for hummingbirds. Easy to grow, it will form a mound that will trail over the edges of pots and containers. Keep these little beauties well watered – but not so wet the soil gets soggy.